Meow there. It’s Sneaky the Library Cat from the Cobble Cove mysteries by Debbie De Louise. As some of you know and all of you should, I have my own blog where I interview pet characters from other books. You can find it at sneakylibrarycat.wordpress.com. I hope you will check it out. 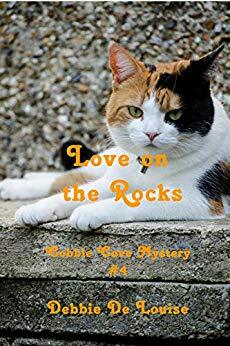 It’s my pleasure to chat on My Reading Journey blog about Debbie’s new release, Love on the Rocks. I have to admit, I wasn’t too happy when Debbie decided to introduce a new kitty into Cobble Cove. This three-colored kitten came to live at the Cobble Inn with Alicia’s best friend, Gilly, who recently married Sheriff Ramsay. The happy couple eloped and celebrated their marriage in Hawaii where they found a kitten on the beach, and Gilly decided to bring it home. Don’t ask me how she got around airport regulations and quarantines and stuff. For those who’ve read the other books in our series, you’ll know that Gilly has a certain way with people, especially men if you know what I mean. Don’t get me wrong. These are cozy mysteries, after all, but Gilly is a shameless tease in a harmless way. What’s less harmless is how she convinces Alicia to investigate crimes with her. I know John, Alicia’s husband, wasn’t too pleased when they started to search for the killer of the man originally suspected of lacing Valentine candy with poison at the Cobble Cove library where Alicia works as a librarian and Gilly as a clerk. Thank you for being part of the book tour for "Love on the Rocks" by Debbie De Lousie. Enjoyed reading the guest post from Sneaky the Library Cat. Can't wait for the oppportunity to read this wonderful sounding book. Your kitty character sounds charming and wise, particularly about his lack of interest in the romance department. :) Best wishes with your book and my your orders be many and your troubles be small! Merry Christmas. Merry Christmas to you, too, Elaine, and I'm sure Sneaky appreciates your comments about his purrsonality.